If you believe mountain biking is over when the sun sets, think again. 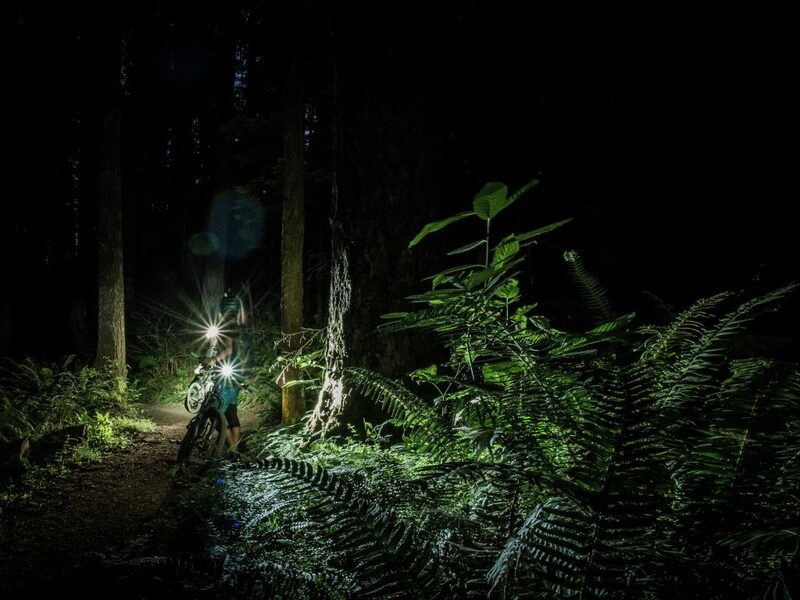 Riding at night transforms familiar trails into fresh challenges, extends your riding season and cuts down on the crowds. Before you and your riding buddies load up the bikes and head out into the dark, here are a few tips to keep in mind. The dark adds an extra element of risk to any endeavor. Be prepared with the essentials whenever you leave home to hit the trail. Make sure to tell someone where you’re going, and ride with a friend. Give your bike a good pre-ride check before heading out. You don’t want to end up doing trailside repairs in the dark. No matter what season you’re riding in, it’s always chillier at night, so bring layers and gloves. Wear clear safety glasses to protect yourself from unseen hazards such as branches. It’s always a good idea to pack the Ten Essentials—gear like an emergency bivy can make all the difference in survival situations. You’ll never regret taking a thermos of something warm and delicious to drink. Lights are the most essential part of your night-riding kit. That may sound obvious, but there’s more to it than throwing a light on your handlebars and calling it good. Ideally, you'll have two front lights, one on your handlebars and one on your helmet, with the brighter light up top. If you only have one light, mount it on your helmet. Being able to point your light toward the next obstacle or section of trail is critical. When mounting handlebar lights, lines and batteries, be mindful of your front brake line and suspension. You don’t want anything to get tangled while you’re riding. Mount batteries near your center of gravity rather than on the top tube, which can decrease standover height. Bonus tip: ski straps (like this one from DAKINE) hold batteries better than the included hook-and-loop straps. 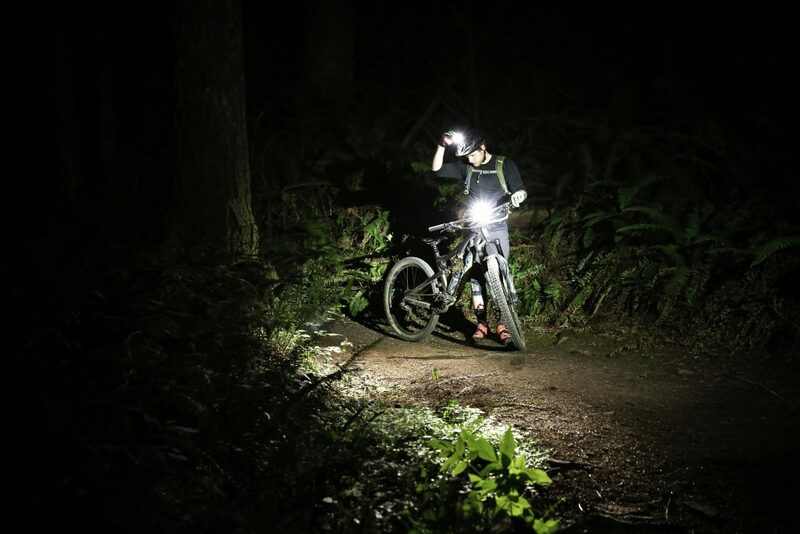 Make sure you know the run-time of your lights, and always carry a backup light or battery, as well as a headlamp. When you’re climbing, you can dim your lights to save battery because you’re not moving as fast and can more easily deal with obstacles like rocks and roots. You can also wrap your batteries in something warm in your pack on the way up to keep the cold from draining them faster. On the descent, hit the brakes and don’t outrun your lights. You don’t want to hit a root you didn’t have the time to see. If you’re riding behind a friend, don’t get too close—your lights can create shadows that might be disorienting. 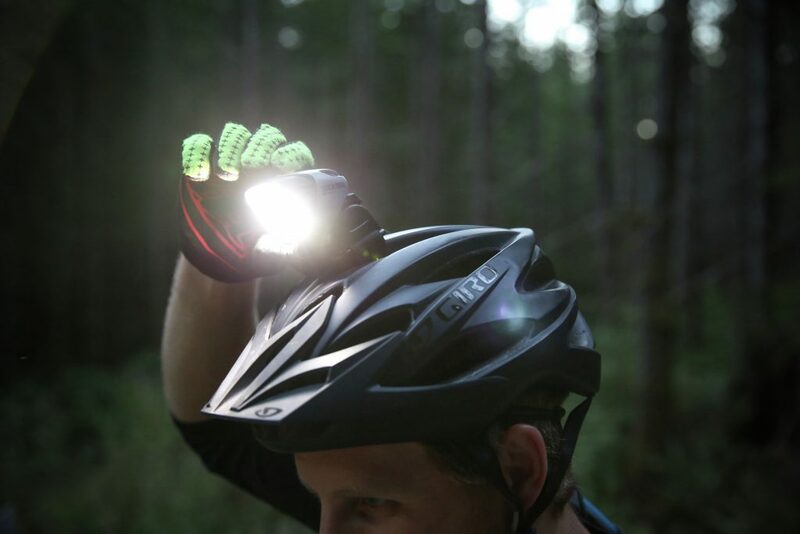 If you’re taking a break, shut off your bike lights and switch to your headlamp. Most bike lights, particularly high-lumen models, are designed to keep cool with the airflow from movement and can overheat when still. Don’t blind your friends! Look with your eyes without turning your head if your helmet light is on. Stick to trails you know well. Darkness makes things look unfamiliar, so having prior experience is key so you don’t take a wrong turn and miss the trail or get lost. Shadows will throw off your depth perception, so approach obstacles with caution. They could be a lot bigger or smaller than you expected. Don’t cut tight into corners. The inside edges will be dark, making objects like stumps difficult to spot. Soften your suspension for more ground traction, and leave the jumps for the daytime. Watch for ice. When temperatures drop at night the trail can get slick, so be aware of the conditions. What about being cognizant of predators such as mountain lions/cougars? Carry bear spray? Wonderful comment. Thank you for bringing it to our attention! We’ll be sure to add a section about being alert to wildlife in future articles. Wear some reflective clothing as it will help finding you if you fall and loose your lights. Some reflective strips in your helmet are great. Does no one at REI think the night bikers should consider the threat, however rare, of wildlife? Thank you for your comment! We agree that everyone should be alert to wildlife when out in the wild. We’ll be sure to add that to future articles. Many small animals (skunks, oppossums, racoons) are active only at night. Many larger animals (bears, some large cats) are active at night as well as in daylight. It is important to be prepared for these encounters. 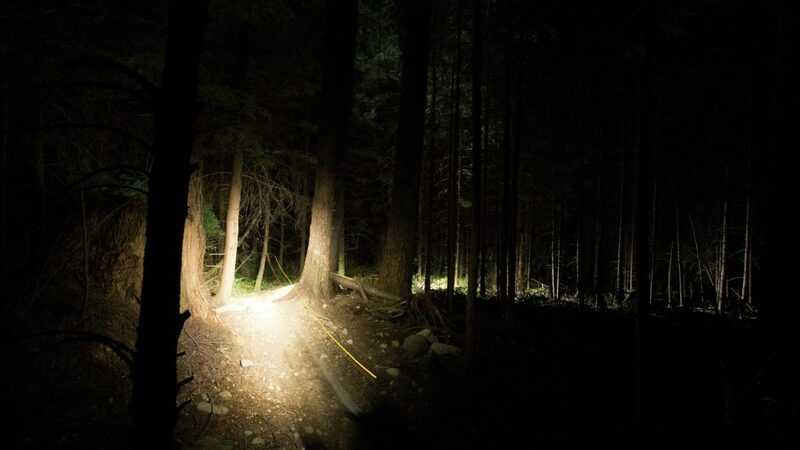 In your article on “Mountain biking in the dark”, you forgot to mention one crucial fact. That’s when top predators come out to play, and they like to chase things going fast in the dark. 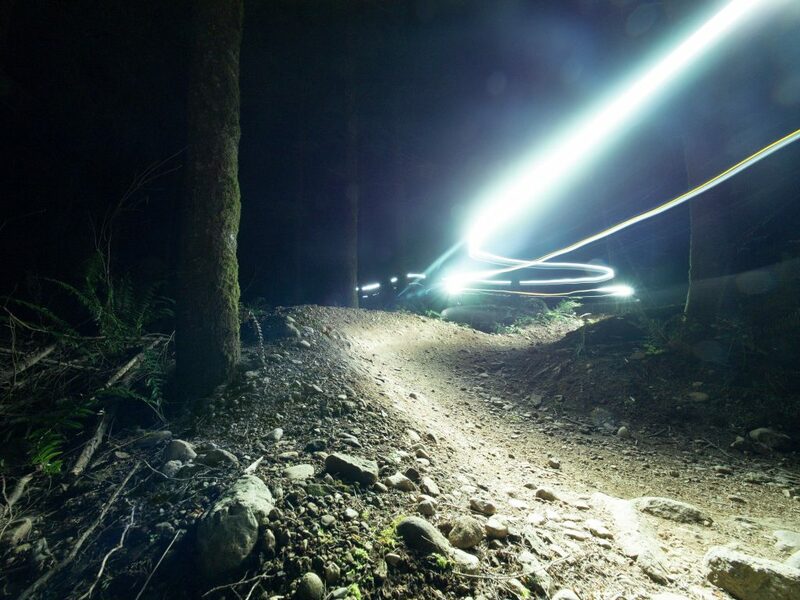 Night riding makes a trail you’ve ridden hundreds of times seem like a new trail. I love riding at night.